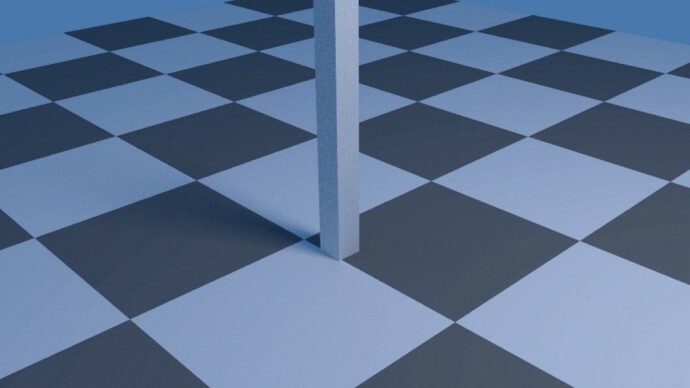 Haha the picture is just a modeled distorted pole! Not a render test with rolling shutter. Get outta here – the background plane is not distorted..you ain’t gonna outsmart blenderheads. The pole is moving, not the background plane. This could be fantastic! Rolling shutter has been a real problem for match-moving with no good solution for a long time. I’ve tried and failed to find any good way to remove it, but I never thought of just reproducing it for the generated elements! I know that getting a good solve when match-moving footage with a lot of rolling shutter and matching the rolling shutter on the CGI are two different problems, but this is still a really important step! I do a lot of match-moving and other integration of video with Blender elements, so I’m always excited to see advances in areas that help that! Thank you so much for doing this! Just a few weeks ago, I came across some rolling shutter images (actually on 9gag I think :) and implemented a small demo of that effect for propellers in a simple mathematical tool called GeoGebra for my personal understanding. When I read rolling shutter is coming to my favourite 3D software I felt it was time to clean it up a little and share it with you guys. You can have a look on a completely interactive (browser-based) demo of some rolling shutter artifacts for propellers here: https://www.geogebra.org/material/simple/id/2294477 . I’m referencing another article on that topic from Jason Cole there. Thanks for checking my stuff out! I updated the GeoGebra version with an animation feature so the scan process can be observed. The sliders and checkboxes should be self explaining: https://www.geogebra.org/material/simple/id/2294477 .